Well anyone who has been following my blog (including me, that's likely a whole 1 person) has seen that I had previously posted a screen capture of a walnut sofa table. For some reason, that version of the table just wasn't doing it for me. I had cross-grain issues, build issues, etc. I just plain couldn't get inspired by it. Then one day, while at work, I catch out of the corner of my eye one of the many furniture pictures I have for inspiration scrolling by on my screen saver. I don't even remember downloading, or having ever seen that photo before, but I fell in love with it immediately. So I went back to the drawing board and came up with the model in the image. The table is made of solid american black cherry with the only exception being the the bird's eye maple drawer fronts. It is essentially all frame and panel construction and is comprised of about 110 individual parts with over 50 mortise and tenon joints. From a design point of view, I think one of the reasons I didn't like the old model was that I tried to include too many strong visual elements. Too much exposed joinery etc. One this table there are only three featured design elements: the first is the contrasting wood drawer fronts. the second is the through dovetails on the drawers and the third more subtle is just the cherry wood grain. If I had to categorize this piece in a certain style I guess it would have to be shaker with some craftsman influence. In the original photo of the piece, there was also a Harvey Ellis style craftsman inlay in each of the two doors. Though I'm keen on learning how to create these inlays, I think it would be too much for this piece. I'd much rather incorporate the contrasting wood tones. To date I've purchased about 50 bd ft of cherry and have milled the parts for the two side frames and I've just started laying out the joinery in the legs. Stay tuned for some photos of the work in progress. Looks like a nice table. 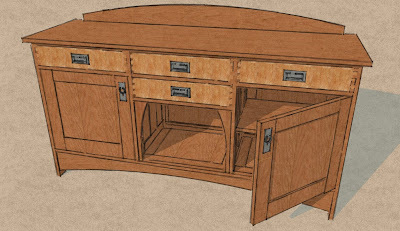 I like the proportions and the drawer fronts will add a nice detail. Good luck with the build. Please keep us posted.